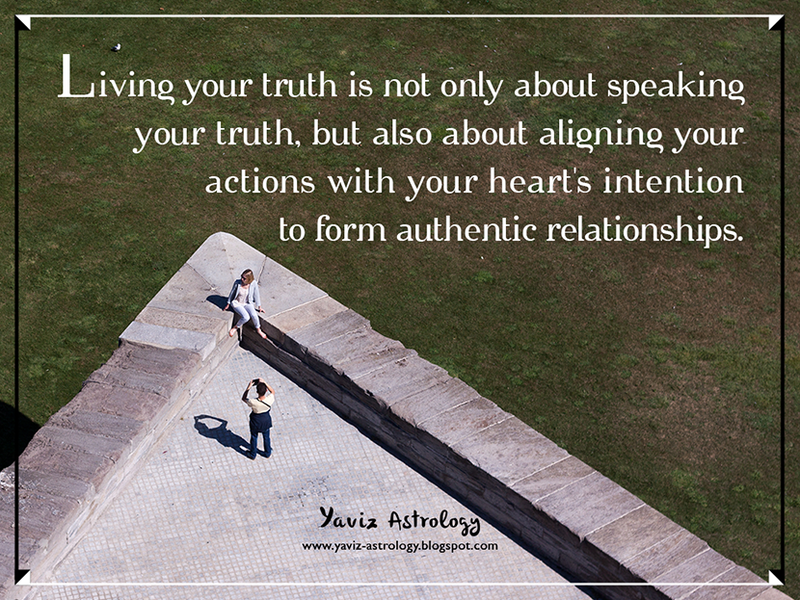 your actions with your heart's intention to form authentic relationships. There is a thin line between telling a lie and keeping the truth hidden. Telling a lie is about the deliberate manufacturing of an untruth, whereas keeping the truth hidden is about knowing a truth that we do not wish to reveal. To put it simply, telling a lie, more often than not, involves the covering up of something we deem to be 'bad' to avoid a fight or an argument. And keeping the truth hidden, on the other hand, usually involves withholding information to spare another person's feelings. Which one is better between the two? Is one really is better than the other? In the end, it all depends on the true intention behind the act of lying or keeping the truth hidden. Are we willing to pay the price of peace and freedom? Are we losing ourselves from trying to make others happy and at peace all the time? How can we form authentic relationships when we are being inauthentic? and keeping the truth hidden. Being authentic is not about saying what's on our minds without filtering them. Being authentic is not about shouting all our secrets from the rooftops. Being authentic is not about going all-out or living out loud, although sometimes it can be. It all depends on the situation and what we are trying to achieve. Being authentic is about being deeply in touch with our strengths and weaknesses, as well as accepting ourselves in all our messy glory. Being authentic is about expressing what we believe to be true about ourselves in small but effective ways, rather than in big but superficial ways. By getting in touch with our heart's true intention, which is to love and connect authentically, we can begin to live our lives more truthfully. By listening more closely to our soul's true voice, we can begin to authentically express ourselves and therefore able to form more authentic relationships in the process. ourselves in all our messy glory. Happy Full Moon! The Moon is conjoining Jupiter Rx in Libra and forming an opposition to the Sun and Uranus in Aries, marking an electric and fiery Full Moon in the sign of the Scales. With the Sun in Aries, a sign which is all about the self, and the Moon in Libra, a sign which is all about the others, balancing compassion for self and others is the key to peace of mind. Have we been kind to others but not to ourselves? Is being too kind a bad thing when there seems to be so much darkness in the world? True wisdom comes from understanding that we can still stay true to ourselves and values while being kind to others. That being kind is not about trying to be well-liked by others, but about bringing more light and grace into our world. That we won't be swayed by influences that aren't in alignment with our truth, because we understand that kindness is not only a gift that we give to others but also to ourselves. to be so much darkness in the world? The Moon is forming a square to Pluto, and it's important to remember that our greatest challenges in life can lead to our greatest evolution and transformation. Why do we feel stuck in unhealthy situations, and seem to be unable to see a way out? Why is it often difficult to break through old, fearful patterns and create new, fearless ones? Perhaps the answer lies in our inability to see our own light. When we are unable to see our inner light, we cast a shadow over our own lives and relationships. Know that the light always brings forth new birth, a constant renewal of life. It is time to be discerning, but to also be open to let our light emerge and illuminate new paths before us. With the Moon's sextile to Saturn, finding balance between giving and receiving can be possible. Although it's impossible to perfectly balance giving and receiving each day, we can still find a healthy balance. How much time do we really give to ourselves? Understand that when we are constantly being pulled by forces outside of ourselves — by other people, by the media, and the demands of daily life, we lose pieces of our spirit. By carving out a little solitude, we can replenish our soul and begin to hear our inner wisdom. The Full Moon in Libra is bringing another chance for us to reclaim our spirit. To take some time to ourselves each day to boost our mental and emotional well-being. To know that by cultivating a healthy and authentic relationship with ourselves, we can form healthier and more authentic relationships with others. For more of my astro updates please go to my Facebook Page.